The large picture of the United States Map provides an overview of the location and names of all the states in America together with the name of each of the state capitals. The United States Map is ideal for kids to use in their school projects. 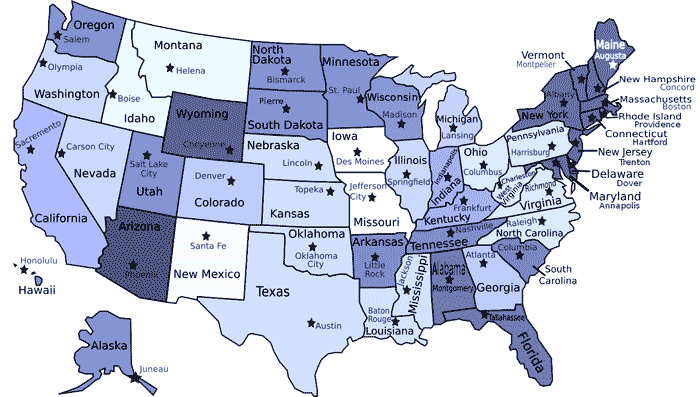 When looking at the map it might prove useful to know some facts and information about the geography of United States Map. Fact 1: The United States is the third largest sized country in the world. United States Map provides details of the outlines and the names of all 50 states. The names of the capital cities is also provided. The location of the capital cities are indicated by a star. The United States map conveys the size of the country - The width of the country East from San Francisco, California to the West, New York City is 2,582 miles (4,156 km). The length of the country from Alaska in the far North to the South is 4,970 miles (8,000 km). Fact 7: The geographic center of the continent of North America is "6 miles west of Balta, Pierce County, North Dakota"
Fact 19: The deepest lake in the U.S. is Crater Lake, Oregon at 1,932 feet (589 m). Crater Lake is the world's seventh deepest lake. We hope that the above facts on the United States Map will prove helpful to kids, school children and schools.